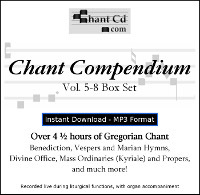 Add Chant Compendium Vol 1-4 Box Set: Over 5 hours of Gregorian chant! to your cart! 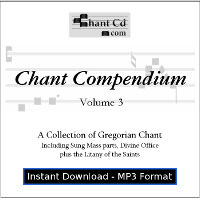 Over 310 minutes (5 hours) of traditional, beautiful, live Gregorian chant! Contains the first four Chant Compendia (collections): volumes 1-4. 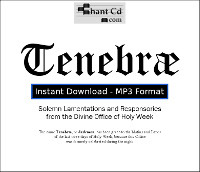 Live recordings made during actual Liturgical functions. All 90 tracks are sung in Latin with organ accompaniment. 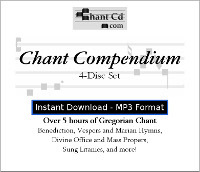 Includes lyrics for every song on each CD. Includes Mass propers, Liturgical chant, sung Litanies (Sacred Heart, B.V.M., St. Joseph, and Litany of the Saints), Kyriales (Set of Kyrie, Gloria, Sanctus & Agnus Dei), Dozens of Benediction and Vespers hymns, Office of Compline (Wednesday, Friday & Saturday), Te Deum (hymn of thanksgiving), Sunday Vespers, countless Marian hymns, sung Psalms, and even the rare Credo VI. 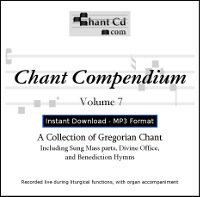 Excellent tool for choir and schola members (and directors!) to learn these beautiful hymns -- the most sublime and exquisite melodies given to mankind. 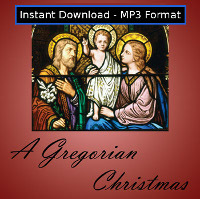 Special Set price (worth over $55.00) -- makes an excellent gift! 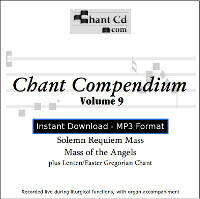 View the contents (including lyrics) of each CD in the set!